On my recent post detailing some of the upgrades Jordan and I are considering for our new home we were rightfully called out on the fact that if we chose all of the upgrades I described, we would be at $20,000 beyond our original plan and there are still additional upgrade options we are waiting for pricing confirmation on. As it turns out, there were a lot more options than we had considered. 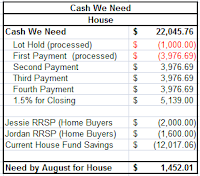 I've recently run the mortgage numbers based on a $360K mortgage on a five year fixed - I wanted to show you that even though I post our best case scenarios sometimes, we are aware of how ever $10,000 will affect us. 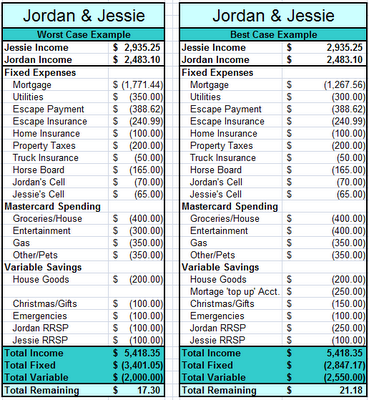 We will be choosing a 5 year variable rate on a weekly basis to align with our pay schedule - so our payments would be $316.89/weekly which works out to be a bit less then the monthly payment (approx $106.60). To ensure that we can afford the 'worse case' scenario - I make sure we can always afford the payments based on a five year fixed rate. Here are examples of our worst case/best case. I can't say for sure exactly where every dollar would go, but this shows that we can afford the house either way - we simply afford ourselves more flexibility if we keep the mortgage lower. I always feel better about things after running the numbers, and I'm still confident in our ability to afford this mortgage, with the upgrades we want. I think that this would be a very boring blog to read if we didn't have any ongoing struggles and challenges to deal with. 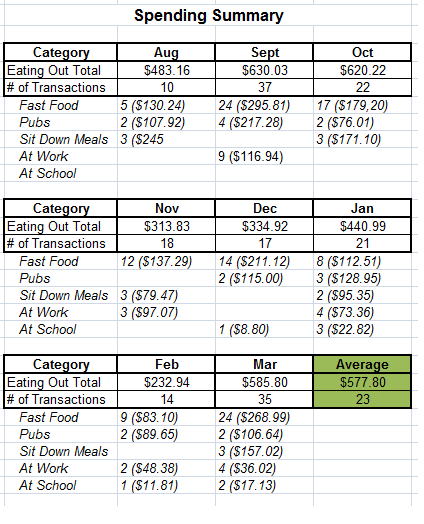 Our biggest spending challenge is eating out, as most of my frequest readers know. I think one of the ways to continue to battle this is to be transparent. I thought I'd mix it up and show it in graph form...March has been our second worst month in the last eight. We know that our biggest opporutnity to save money is in our 'eating out' category and probably our biggest opportuniy to be healthy too. I share this not to be judged, but to stay by my committment to work towatds getting better - slow but sure (in this case, very slow). I was recently awarded a pay rise during our annual salary review at my company. My level within the company increased from a junior to an intermediate and as such I moved salary bands - yay me! I've been working very hard the last few years to acheive this! 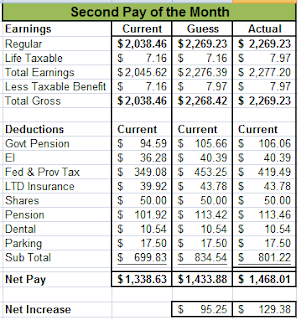 I received a 11.32% increase which takes me from $53,000 to $59,000 annually! Because I'm me, when I found out about the increase to see if I could guess exactly how much my take home pay would be, I'm please to share that I was pretty close. I was so so close to getting this right! Jordan and I are both very excited that we'll have an additional $260/month to add to the budget! This will certainly help with the wedding in the short term and mortgage payments in the longer term. Lets cross our fingers that he gets a raise this year too! Huzzah! Today, I discovered my public library. I'm getting geared up to study for my first of two CHRP exams and needed some reference material. I didn't want to purchase textbooks, just wanted to supliment some of my old ones from University - so off to the library I went. I haven't gone before mostly because I thought it was just too far out of the way w/ no parking. Well, there wasn't any parking, but Jordan dropped me off and just drove around for a while before coming back. $12/annual membership fee - not so bad. Building our House - Upgrades! I'm not sure how many of my readers have built a house, but those who have are well aware that the 'base model' of a home lacks a lot of the finishing details that turns a house from a home. Jordan and I have been very conscience of our budget and have still managed to reach our cap before all the numbers are in. At each appointment you are presented with the standard pacakge and then possible upgrades. While there is nothing wrong with the standards, they are not perfect either. I was taller than the basic fridge, for example. As we make our choices we are wary of both our budget and the time investment in the home. Jordan and I intend to live this home for 10-15 years, if not longer - so our choices have to have some longevity to them. At this point, we actually haven't signed off on anything yet - so we can still add/delete items off the house list/uprade items that I'm about to share with you. I had a chat with my mom tonight and she was curious to see how/why the uprades added up so fast because after each appointment i've chatted with her, and she was surpised when I told her tonight that we already it $350K. My Boots - 1/2 Done! Jordan and I stopped by the Boot store on Thursday to meet with the Best Man who is buying the same style of boot that Jordan is. They same sales person was working and showed me the progress on my boots. The colors look amazing! I honestly wasn't 100% sure that I made the right choice, but didn't want to admit it because of the $$ and Jordan had such good luck with his - I am so happy right now!!! 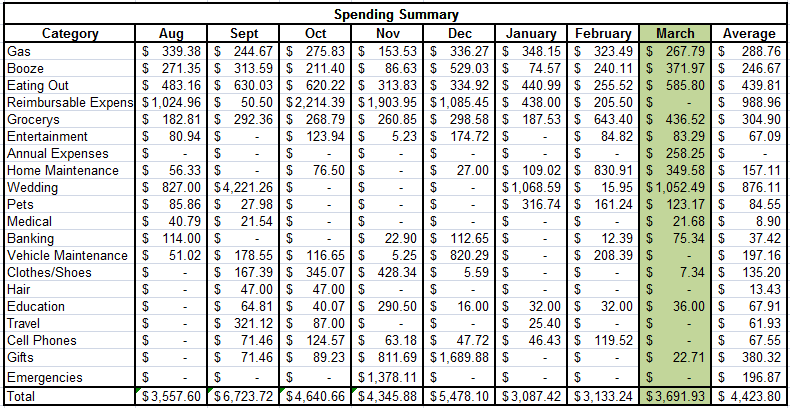 Yesterday I posted the total March Spend Report, but I wanted to break out the wedding category for those who are also planning their big day. 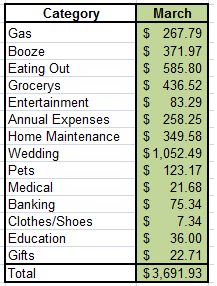 It doesn't take very long before you've spent $1,052.49. 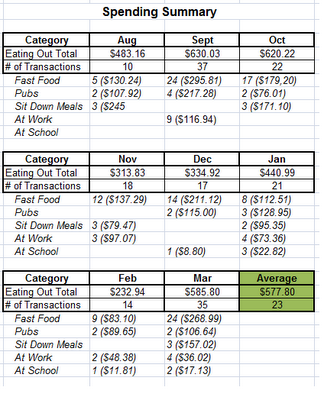 Here is the summary of our where our variable dollars went in March. We spent a tonne on eating out...again. Booze was a lot, but I'm not really surprised. 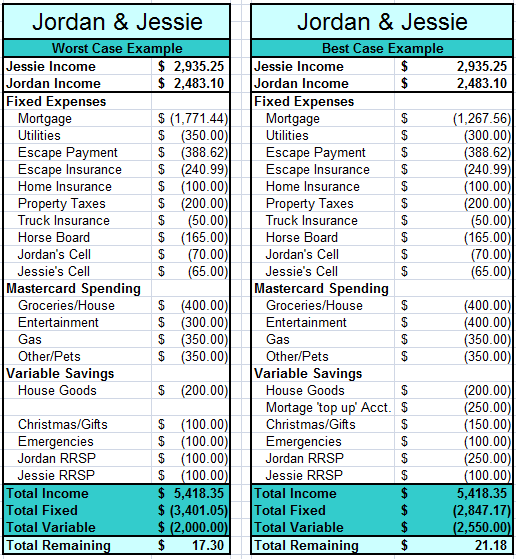 Annual Expenses included renewing our tenants insurance and Jordan's truck registration. Home Maintenance included some adapter thing for the TV and an Energy Efficiency Rating Assessment for our new home. The wedding was a slue of things (I'll put in a separate post) - the rest was just miscellaneous items. I had a great visit with my mom and grandma on Sunday/Monday we got a lot of errands run for them and I got to decompress and talk wedding talk. A few conversations in with my mom had me admitting that I've been ignoring the money a bit because I know it's really tight - which of course, is not going to make anything easier. 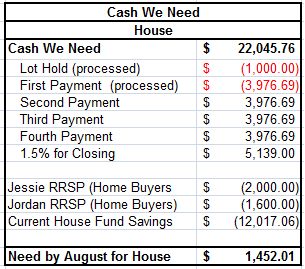 The total cash we need for the house includes our 5% down payment and 1.5% for closing costs for a total just over $22K. 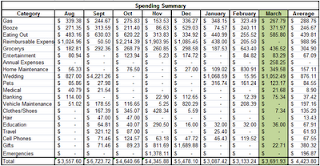 In my spreadsheet, amounts in red have already been processed by the home builder. We have submitted the request yet, but we'll be used our RRSP's for the majority of the 1.5% we need. Now that I see the big picture, It won't be so hard to come up with another $1,500 for the rest of the 1.5%. This money won't necessarily be spent, but it is a requirement of the lender that we have it available for closing costs. They need to see the money in our accounts three months before we close, so we should have it there by August. We've currently spent just over $4,500 on the wedding and have about $11,500 left worth of project expenses (breakdown to the left). 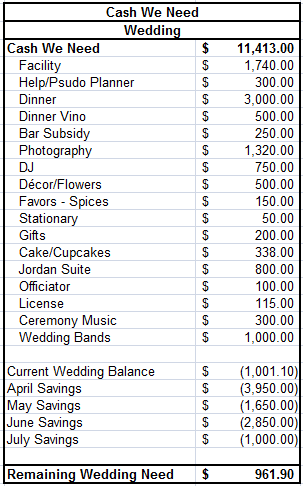 The current wedding fund has dwindled due to the aforementioned expenses, but my projected monthly budgeting has has in good shape. It looks like we'll need about another $1,000 in addition to what we are projecting to save/spend over the next few months. We have to keep in mind that this does not include money for our honey moon, but I do have money set aside in August's budget for that. So, all told we need to come up with another $2,500. That's actually not so scary. I should also probably admit that our current credit card bill is really high, but I'm going to pretend for the next five minutes that it's not. I'll do a credit card post tomorrow to own up to that. A few people seemed interested the other day when on my frantic 'to do' list they saw that we were going to be wearing cowboy boots for the wedding. Jordan was able to find a pair that fit perfectly and were the right colour! 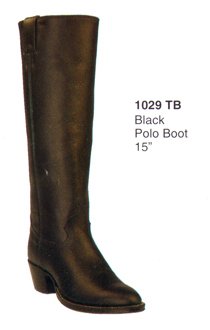 My boots will be be 15 inches instead of the standard thirteen - yehah! I'm pretty excited about that! They will have a the same stich pattern as Jordan's and will also have black tops, but purple bottoms! The picture to the left is just to show the height. They didn't have exactly what I was looking for, so my boots will be custom made (an extra $60) and will be ready in three to four weeks! 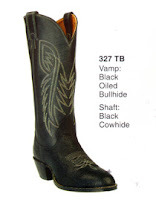 Jordan's boots will have a pattern similar to this one, but have a charcoal grey toe - I couldn't find an exact replica so will have to take a picture and post it later. We were able to get a 20% discount on Jordan's and 10% discount on my pair, which is super exciting! So we wound up spending a total of $554 ($306 for mine and $248 for Jordan's).